Mama Buzz has a replacement. Get over yourself and go there. There's plenty to love at Telegraph. Hours: Tue.-Fri. 11 a.m.-10 p.m., Sat.-Sun. 10 a.m.-10 p.m.
As it turns out, the suit was for Mardikian's mother's birthday party earlier that day, which I'm pretty sure makes him the opposite of a douchebag, though I suppose it's always good to be vigilant. Especially if you're in his position — specifically, that of the person who took over the long-ailing Mama Buzz. The coffee shop's legend is long and, at this point, pretty much superfluous, but suffice it to say the place was well-loved. tUnE-yArDs, famously, got its start here, and it was one of the founding members of the Art Murmur collective. I personally know one person who completed his entire master's thesis sitting on one of those stools at the coffee bar, and no fewer than three long-standing couples who trace their origins to the place's cheap beer and relentlessly charming patio. 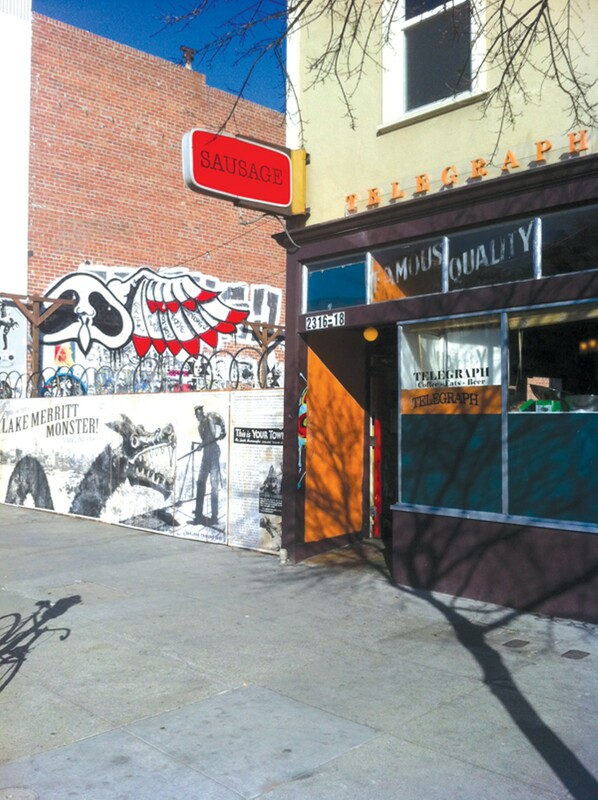 Generations of Buzzards — as one Telegraph employee, himself a Mama Buzz alum, referred to them — were weaned on its coffee/beer/live music/vibes, and were commensurately incensed and saddened when it closed suddenly at the end of last year. ("Achey breaky heart, yo," wrote Yelper Lizz E., which sums everything up sort of perfectly). So. 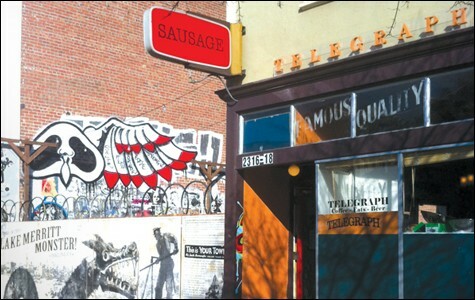 A beloved local institution replaced with something new and different, run by a guy who has worn a suit at least once: It would be very, very easy to hate Telegraph, except it's actually astonishingly easy to love. For one thing, Mardikian — who actually used to live right above Mama Buzz, back when it was Papa Buzz (his father, Haig, still owns the building) — seems genuinely committed to retaining the look and feel of the old place. "I wanted to do something fun and inclusive and playful and related to the arts scene — a place where people can come and hang out for $2, particularly outside," he said, suspiciously un-douchily. "That hasn't changed. But I'm trying to put my own spin on it." He's made some changes, but, truth be told, they're only good ones: He replaced all the plumbing (which was rotting and rusted after years of disrepair), added a selection of house-made sausages (which are delicious and coleslaw-smothered and entirely reasonably priced) to the formerly-vegetarian menu, made some design tweaks (which are largely unnoticeable but ineffably pleasant). The side patio, which seats easily a hundred at big, sturdy, be-flower-potted picnic tables, is strung with little lights and buttressed by murals on either side; inside, it's all retro-soda-fountain flair, this time around in butter-yellow instead of blue and red. There's still art on the walls and attractively grimy people on the patio; the coffee's still strong and the beer's still cheap ($2-$5ish, in bottles and on draft). The side room still doubles as an art gallery (at the moment, it's intricately rendered portraits of pop-icon musicians) and still has wi-fi — except now the signal is stronger. The new ownership hired back pretty much all of Mama Buzz's old employees who asked for a job, and they appear to like the new setup. The sausages are a big hit, and Mardikian plans to bring back live music just as soon as he gets the paperwork in order. On, say, a sunny Saturday afternoon, with Wanda Jackson on the stereo system and the big Bay Area sky cracked up wide and cloudless above you on the patio, it feels like just about the best place in the world to drink a beer and read a book. The Buzzards are slowly coming back. Under new ownership, the café's future is uncertain.